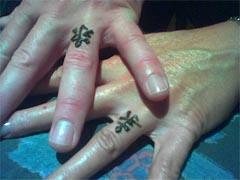 I receive alot of inquiries as to the meaning of henna tattoos. While different cultures, and different tribes within a culture have symbols and patterns that carry a meaning for that community, it is my experience that most clients here in Florida choose symbols that have a meaning particular to them. This photo is a perfect example! A couple, who were soon to be married, choose to have the kanji for eternity done on their ring fingers as a symbol of their commitement to each other. While the kanji has its own meaning, the choice of this design, and the location was especially important to the couple.